May you have a happy and holy Christmas! At this writing, we can�t say exactly when we�ll get final authority to transmit at 25,000 Watts -- we�ve hit a small procedural snag as part of the licensing process. It�s not a big deal, but consulting engineer Jack Mullaney has been unable to contact the one person at the FCC who can sweep it away. With luck, we�ll be at 25,000 Watts by the time you receive this. We are patiently waiting. In the meantime, thank you for your helping hand and your prayers throughout this past year. We never tire of saying that it is you who holds this vital radio mission together. As we prepare to celebrate the birth of Our Lord, we offer special prayers on your behalf. May His Light shine upon you and all those you love. God bless you! CHRISTMAS INSPIRATIONAL SPOT: No one can celebrate a genuine Christmas without being truly poor. The self-sufficient, the proud, those who, because they have everything, look down on others, those who have no need even of God -- for them there will be no Christmas. Only the poor, the hungry, those who need someone to come on their behalf, will have God. Without poverty of spirit there can be no abundance of God. 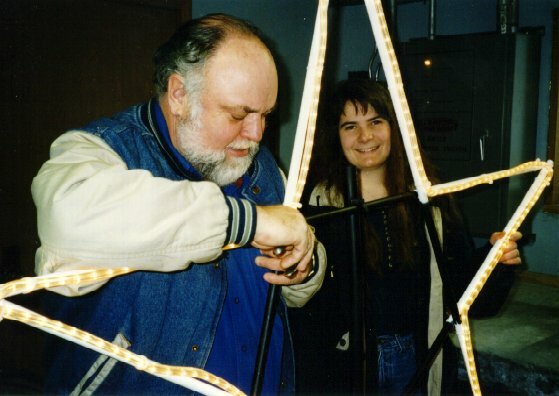 top A STAR IS BORN (left) Les Brown attaches a new encapsulated lighting strip to the 5-foot KNOM Christmas Star, as volunteer Connie Fessel lends moral support. The new lights should be brighter and more rugged than in the past. 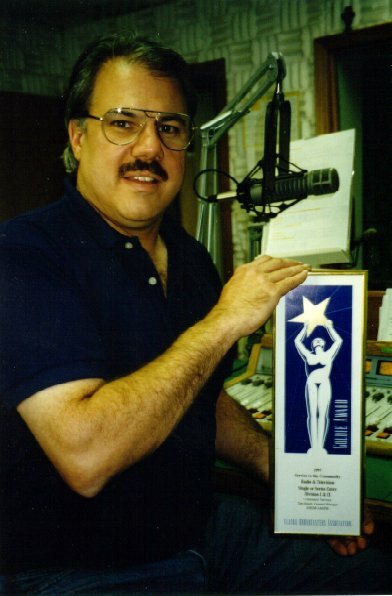 SECOND YEAR IN A ROW: (Left) KNOM program director Ric Schmidt holds up KNOM�s �1997 Community Service Award� from the Alaska Broadcasters Association. This is the third time that KNOM has been given this prestigious honor, the top award for all radio and television stations in Alaska, and the second year in a row. What do we do that�s so special? Well, in addition to all of our inspirational material, KNOM broadcasts an incredible volume of educational programming -- some of it purely educational, much of it aimed to combat this region�s many serious problems, like alcoholism, domestic violence, suicide, drownings and other accidents. We air traditional Eskimo songs and stories, an immense volume of local and regional news and weather, regional talk shows and call-in programs that address serious issues, and we provide many small services to our listeners. For one thing, we announce the departure of every bush flight from Nome. It is truly a distinguished and powerful signal, brightening the lives of the 94.8% of village adults who listen to us every day. Thank you for making this award-winning Catholic beacon possible. Gifts of stock or securities should be assigned to �Catholic Bishop of Northern Alaska #5,� account number 014-04023-067, Ragen McKenzie, Inc., attention: Rodger Hughes. Their address is 215 Cushman Street, Fairbanks, AK 99701, phone 907-451-7767, DTC number 733.
ou should notify both Mr. Hughes and KNOM general manager Tom Busch in writing that the gift is intended for use by Alaska Radio Mission -- Station KNOM. All donations to KNOM, of course, are tax deductible to the full extent allowed by law. Our IRS tax identification number is 092-0019215. LIKE ADDING TINSEL TO A TREE, KNOM sprinkles special Christmas spots into the program day, and hours of Christmas hymns and songs, starting in early December. It sounds wonderful! AS TIME GOES BY: In the middle of November, contractor Randy Pomeranz finally began to pre-fabricate the walls for our 12-foot generator shed. Time and weather were beginning to run out. The 66 kiloWatt Northern Lights diesel generator was at the studio, ready to be hauled to the remote site. This project has seen many delays, but at this writing, we still have faith that our transmitter site will once again have an emergency power generator before early December. After that, the snow will probably be too deep to allow vehicles down the isolated drive to our tower, and it drifts too quickly to make plowing feasible. Please keep praying and watch for news next time! 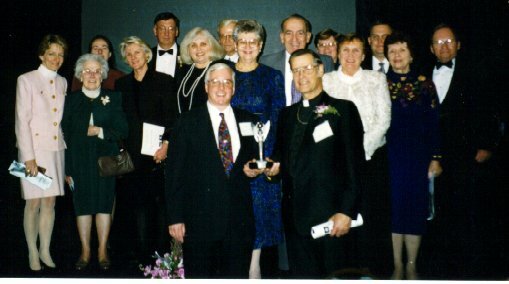 After the ceremony at the Arlington Hilton Hotel in Virginia, Bishop Mike and Tom Busch posed for a picture, together with some of the 20 wonderful KNOM supporters and friends who turned out for the event (left). Other groups which won lesser Gabriel Awards, such as �Best News Story,� included Dateline NBC News, CBS News, WHYY Philadelphia, WMAQ-TV Chicago, WBEZ Chicago, the Canadian Broadcasting Corporation, KPBS San Diego, WMC-TV Memphis and KTTV-TV Los Angeles. As we�ve written, this is the incredible 5th time that KNOM has received this tremendous honor, which we joyfully share with each of you, whose prayers and financial assistance continue to keep our mission alive and beaming strong. -- remember that Jesus the Christ is God�s Gift to us. Make your celebration a gift to God. top BERRIES, WALRUS MEAT, FISH...just some of the native foods which people throughout the region have donated to families in the village of Shishmaref, pounded by Chukchi Sea surf. This has not been a particularly bountiful year, but folks generously have been giving what little they have to share. WHERE HAS HE �BEAN?� Why, at Harvard University, working toward a PhD in the ancient Hebrew language. Now, ten years after his first visit to Nome as a KNOM Jesuit Volunteer, we announce with joy that Paul Korchin is re-joining the mission as news director. Paul will continue his studies while living here; he plans to move to Nome just after Christmas. Welcome, Paul! NO LACK OF NEWS: Paul sure has his work cut out for him, as there has been a lot of news recently. Tragically, seven family members and a pilot were killed shortly after takeoff from Barrow, en route to a village funeral, when their plane nosed into the Arctic Ocean...in early November, the police chief of Unalakleet and a passenger died when their snowmobile crashed through river ice. Please keep them and their families in your prayers, won�t you? CHRISTMAS INSPIRATIONAL SPOT: I�ll miss you this Christmas, dear one, of all the times. Yet I can�t help being happy that you will actually be sharing Christmas with the Person whose birthday we are celebrating. Wish Him a happy one for me...and know that you are loved until we meet again. top REINDEER HEIST: They�ve been driven to the Seward Peninsula by snow in Alaska�s interior, thousands of caribou of the Western Arctic herd. That�s bad news for area reindeer herders, as the semi-domesticated reindeer tend to wander off with their wild relatives. AT HIGH NOON CHRISTMAS DAY in Nome, the low Arctic sun casts your shadow over 100 feet long! A DEMAND FOR THE SUPPLY: Thank you to friends who helped purchase for the mission six 600-watt emergency battery supplies, which keep equipment humming during power outages, in the 20 seconds it takes for our emergency studio generator to kick in. The power supplies help cushion the strain, saving costly wear and tear on the equipment. Thank you! Also, special thanks are due to former KNOM volunteer and program director John Albers, who has just put the finishing touches on a new, super-secure fence surrounding the 81-foot tower at our studio! CHRISTMAS INSPIRATIONAL SPOT: What shall I give for Christmas? A listening ear to a friend that hurts. A kiss and a hug to a handicapped kid in the hospital. Time to read for someone who can�t. A firm handshake to someone who hasn�t been to church in a while. A note to someone who is shut in or not feeling well. How simple our Christmas shopping list can be this year...and every year...when we give gifts of the heart.